Final Fantasy XIV's producer has explained his perspective on why the game is having a rough go. With Square Enix recently extending Final Fantasy XIV's free trial period yet again, for a total of 90 days over the average MMO's 30 days, the company obviously realizes that the game has issues. Final Fantasy XIV producer Hiromichi Tanaka took to Famitsu magazine to explain what went wrong with its development. 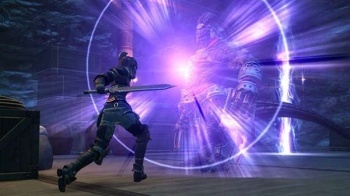 Tanaka said that Final Fantasy XIV's launch was actually "very quiet" when compared to Final Fantasy XI, Square Enix's first foray into a Final Fantasy MMO which had its own problems at launch. The difference is in the "assorted issues" surrounding frustrating gameplay mechanics that many players are complaining about. These mechanics arose from what Tanaka says is the challenge of developing a PC MMO that is planned for release on a console. "We placed too much emphasis on making the game compatible with console controllers, so it's just not suited well for mouse control -- that was a huge issue with PC gamers," Tanaka said. "There really needed to be two different control schemes for console and PC, since both user interfaces work so differently from each other, but our development team didn't get around to that." He calls fixing the interface a "top priority" for the Final Fantasy XIV team, but adds that there's also a "mountain" of other issues the team has to tackle. While Square will be fixing mechanics regularly through updates in November, Tanaka admitted: "New problems are being brought up more quickly than we can deal with them." Still, he has a can-do attitude, and is confident that all of Final Fantasy XIV's issues will get fixed while Square also finishes the game's PlayStation 3 version with these fixes included. You really have to hand it to Square Enix here. While I'm not exactly praising the company for releasing a game that wasn't ready for retail, at least it can fully own up to its mistake. The unique thing about an MMO is that Square can just keep extending the trial period until it makes things right, and the people actually enjoying the game are probably thankful for that.